Palawan is a very interesting island of the Philippines. The attraction of this island lies in the natural landscape of tropical, exotic beaches, and the cluster of islands unique. 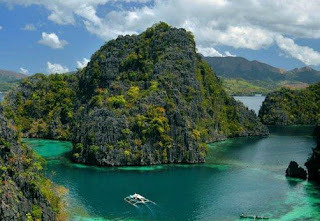 Palawan become one of the best tourist attractions in Philippines you should visit. The island is located between the South China Sea and Sulu seas, it seems to have a special magnet for tourists. Just imagine, nearly 1780 islands, rocky bays, coral reefs and white sand beach that stretches across the ocean that surrounds the island of Palawan. Expanse of green colored rocks that towered into more value for Palawan. Even if the rock hills seen here are similar to those in Raja Ampat, Indonesia. Palawan island does have an amazing natural. Provinces with the capital of Puerto Princesa is also home to many animals. A variety of unique fauna exist here, such as mermaid , monkeys, parrots, raccoons, armadillos, to the peacock. Make no mistake, these animals have special protection from the Philippine government. No tourists who says "bored" when vacationing here. Many things they can do here. Keep in mind, Palawan is also considered to become one of the best dive sites in the world. Honda Bay Island, an island in Palawan have been very popular among the snorkeler and diver. Manta, dugong, hundreds of species of fish are beautiful, and pristine coral reefs to underwater natural ornaments Palawan. In addition, the traveler can also visit other exciting locations. There Tabon Cave, Ursula Island Game Refuge and Bird Sanctuary, Coron Reefs, and spend the evening in Bataraza. If given a chance on vacation to the Philippines do not miss to enjoy the natural beauty, Palawan. Travelers simply fly from Manila to Puerto Princesa, or set sail aboard the ferry for 20 hours.